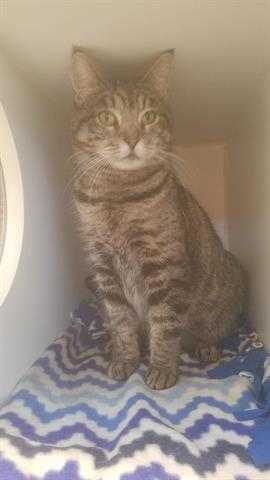 Ellie is a three-year-old, gray tabby cat. Ellie is FIV positive, which means that her immune system is not functioning as well as your average three-year-old cat. Feline Immunodefiency Virus cannot be transmitted to humans, or dogs. It can be transmitted to other cats though, so it would be best for Ellie to be housed as an only cat, or with other FIV positive cats. Fortunately, Ellie is capable of living a long and happy life given a stress-free indoor environment. She would love a warm window sill to bask in, and a human companion to enjoy it with.